Making a career change at 50–or later–is not just the realm of the lottery winner or risk-ready entrepreneur. It’s possible for you, too. 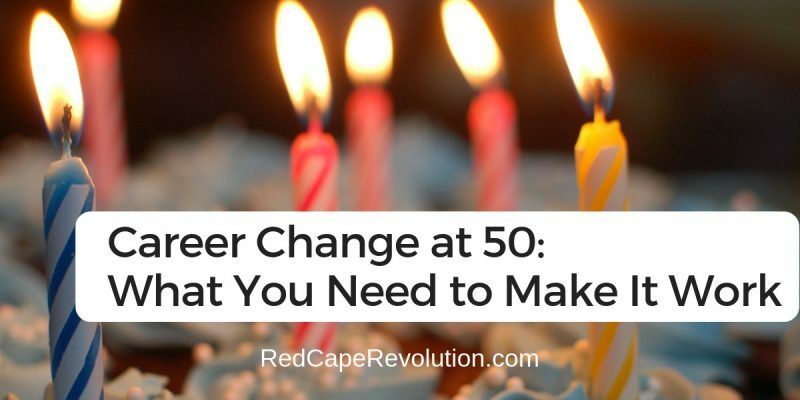 In fact, more and more people are making a career change at 50–or older–because they’re ready to make a conscious choice about their life at work. They want a life that works for how they want to live. They want one that makes a difference to their family or their community. They want to bring their superpowers to work. Careers in general are no longer just for the young, the climbing, the hungry. A career change at 50 can serve many different needs, and it may be just the thing you need during your next few decades in the workforce. The battle of the brain is the first one to win if you’re making a career change at 50. You need to believe that change is possible before anyone else will consider it for you. Having conviction that you’ll figure it out may be the most important threshold to cross. But those beliefs are vapor. They’re just our primitive brain trying to keep us still, keep us safe. Get out into the ocean. In fact, shifting your perspective from “gee, who’d need me?” to “I know there’s someone out there who needs me, and it’s my job to find them and help them” can give you the conviction to move forward on this journey. When making a career change at 50 or any age, most people make a big mistake. Then they plunge in and start searching for anything. Not long later, they emerge exhausted, panting for air, finding nothing. You will start with clarity. Clarity of knowing who you are and what you want allows you to filter out all the waste from the potential bucket o’ careers . It sounds counterintuitive, but narrowing down the scope of what’s right for you actually makes it easier to explore options. Clarity helps you focus, and say no to opportunities that just don’t make sense for you–no matter what anyone else thinks. You’ve got conviction: the belief that you can. You’ve got clarity: the knowledge of who you are and what you want. Now, it’s time for conversations. But with whom? Don’t fall into the trap of going to job seeker events or networking meetings where people are too quick to hand out their business card and not exchange in true connection. Start having real, honest conversations with people you already know. Don’t assume people know what you’re thinking about what’s next for you–even those closest to you. Start engaging people, one at a time, in your current quest. You already know how to have a conversation. It’s built-in standard equipment for you as a human. You were created to have relationships, interact with people, and not go it alone. So use it to accelerate your career change. With your conviction, clarity, and conversations, you’re now ready to start applying your own curiosity. What are the problems you’re hearing from your conversations? Applying your curiosity to the data you’ve gathered both from your own clarity and the conversations with others helps you narrow down your next steps. The Stillwater band’s plane hits turbulence. Hans is encased in carbonite. If this were a movie, what would the next scene be? Who would be the characters that show up? What would the hero do? Since I am the hero of my life, what do I need to do next? This conversation helps your brain get unstuck and start to do what it’s built to do–create ideas and action. Here are questions you can ask that go deeper and uncover new information you can use. Finally, the most important step if you want to make a career change at 50 is to keep taking action. Even baby steps–one new conversation, one spark of an idea to follow-up–will all lead you somewhere. Don’t give up. It’s never too late to have the career and life you want. It’s time to do the work to make it work for you.